“When Gerry discusses his albariños his voices rises and his enthusiasm goes into high gear, as does the prose in his tasting sheet on albariños from members of the Asociación de Bodegas Artesanas. 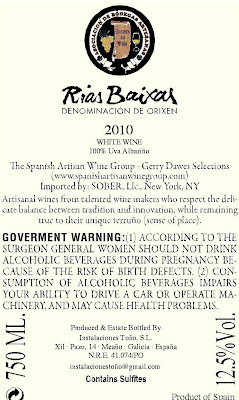 Back label in Spain for the Asociación de Bodegas Artesanas, Autores do Viño. I am not knowledgeable enough to say whether they are the greatest or not, but I loved the scintillating, complex 2010 Albariño from O’Forollo ($23.99); enjoyed the lush, flavorful 2010 Avó Roxo ($24.99); and admired the lithe, fresh 2010 Cabaleiro do Val ($24.99). 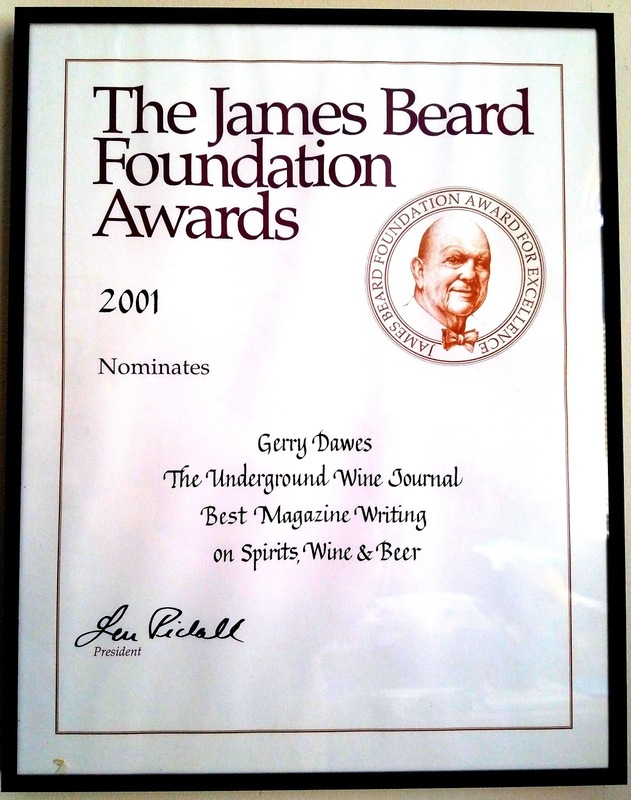 I wish I had drunk these wines with seafood, as Gerry did, in Rías Baixas, a marine paradise. 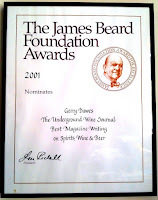 They would have been accompanied by ostras (oysters), almejas (clams), cigalas (langoustines), nécoras (small hard-shell crabs), vieiras (sea scallops) and zamburiñas (bay scallops, sort of).” - - Howard G. Goldberg, writer for The New York Times, Decanter and others. Back label in the U.S. for Avó Roxo, member of the Asociación de Bodegas Artesanas, Autores do Viño. Among these artisan Albariños are some unique and stunning examples of how great Spanish white wines can be. 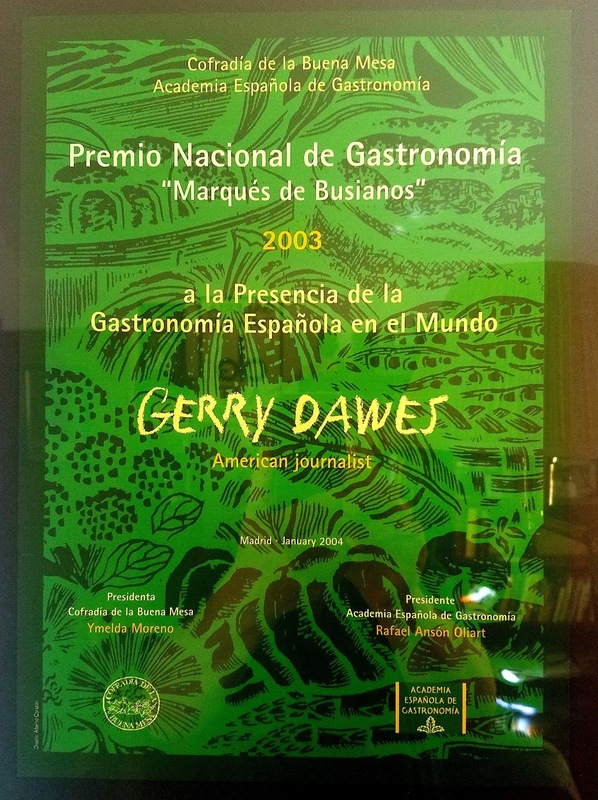 The Spanish Artisan Wine Group - Gerry Dawes Selections imports six Albariños from the Asociación of Bodegas Artesanas, which has 14 small grower-producer members, most of which produces 1,000 cases or less and use indigenous yeasts to ferment their wines. Though each producer's wine is distinctly different from the others, each is a jewel in its right and several of them are amongst the greatest Albariños I have ever drunk. There are at least four more producers that The Spanish Artisan Wine Group - Gerry Dawes Selections may bring in. at Lagar de Broullón, owned by José Pintos Pintos (third from left). The Spanish Artisan Wine Group - Gerry Dawes Selections imports six Albariños from same municipio, Dena-Meano, in the Val do Salnes, all from a group of independent grower producers who are members of the Asociación de Bodegas Artesanas (the Association of Artesan Wineries). Each member farms his own-clone grapes and makes unique, individual terruño-laced, spoofulation-free Albariños of character, style, grace, balance, charm and breed in his (or her) own adega (bodega) using wild native yeasts to ferment the wines. These producers do not believe, as many commercial wineries do, that they should bottle early in the year after the previous vintage. Most bottle their wines in early July, in time for the group’s Festa do Albariño held each year in Meaño at the end of July. Albariño, Val do Salnés Rías Baixas (Galicia). Photograph by Gerry Dawes©2012. With the Bodegueros Artesanos, the taste of their unique wines is driven by what tastes best to each of them, not what "the market is asking for." They make some of the most intriguing and best white wines of Spain. The Asociación de Bodegas Artesanas stages their Festa del Encontro do Viño de Autor the third weekend in July in La Praza de Feria en the center of Meaño each year. All the bodegas in the group pour their wines for several days and there is great Galician food–fabulous bread (including pan de milla, corn bread), pulpo (steamed octopus), Galicia stews, percebes (goose barnacles), chorizo, grilled food, filloas (crêpes), etc.–which can be purchased. The Festa del Encontro del Vino de Autor wine fair is usually the third weekend in July. 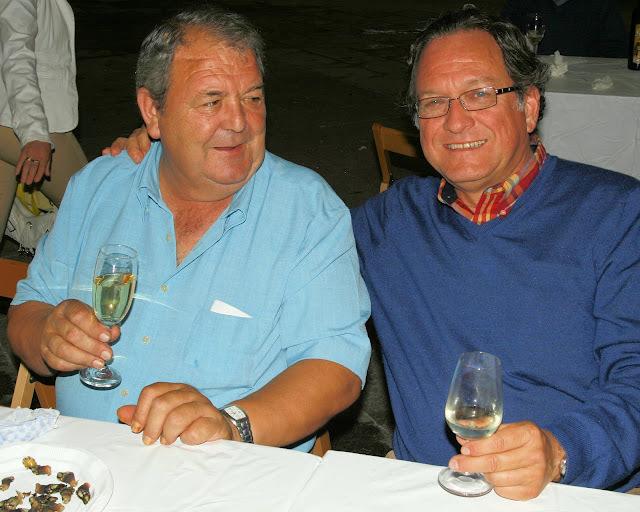 Gerry Dawes with Francisco (“Paco”) Dovalo López, owner of Cabaleiro do Val, is the founder and president of the Asociación of Bodegas Artesanas, Rías Baixas, Galicia. Cabaleiro do Val, Paco Dovalo's great Albariño, Asociación de Bodegas Artesanas. Cabaleiro do Val was officially incorporated as a bodega in 1989, although Paco Dovalo López has been producing his vino de autor signature wine all his life in an old granite stone farmhouse that he inherited from his ancestors and dates from 1834. A section of the house is the old bodega, where the Dovalo family has been making wine for more than 100 years. In the garden of the house is a huge old grapevine, estimated to be at least 150 years old, that measures more than three feet in circumference and has branches 30 feet long (vines are trained on the trellised parral system here). at Cabaleiro do Val in the garden of Paco Dovalo's home. 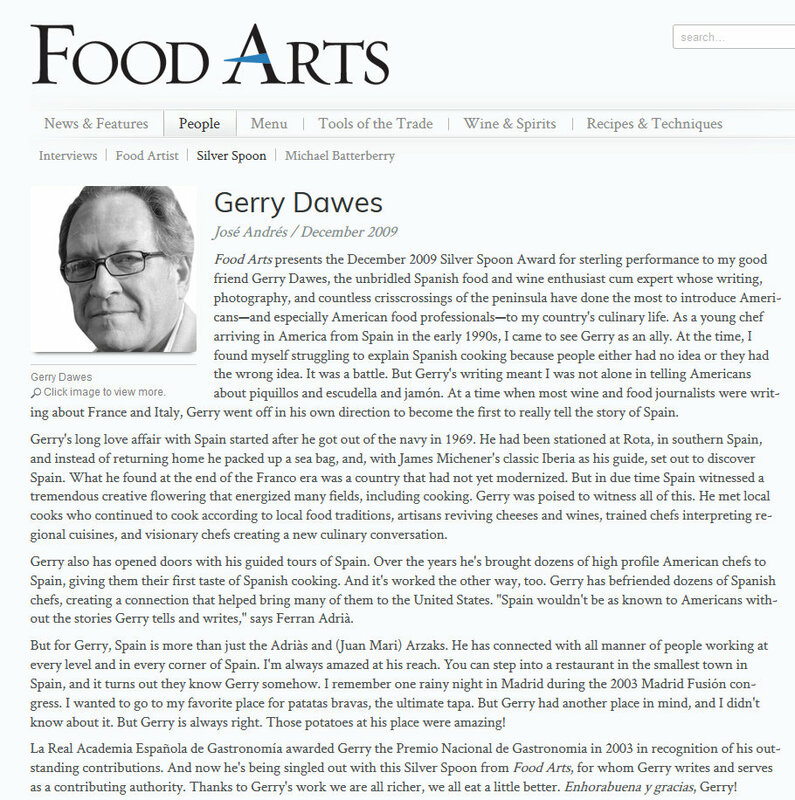 All Photos by Gerry Dawes©2012. In the early 70's, there were numerous little known grape varieties such as Espadeiro, Tinta Hembra, Catalán, Hoja Redonda and even some unknown grapes growing in his vineyards and though he kept a some of these varieties to study their characteristics, he decided to use only Albariño in his wines. 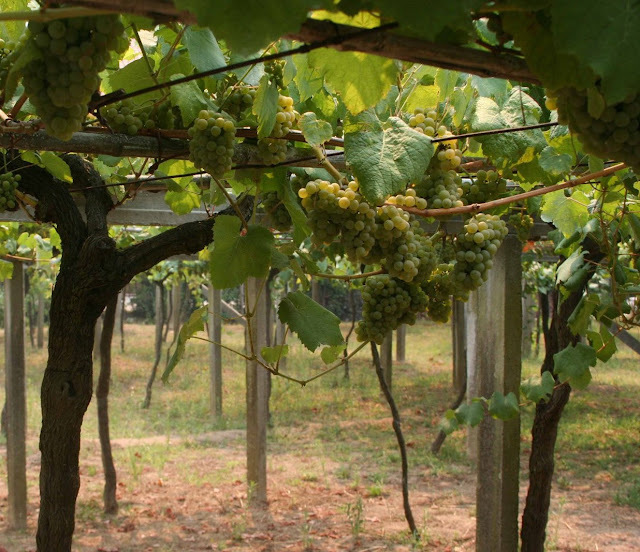 At the time, there were also strains of Albariño estimated to be more than 150 years old. Dovalo took cuttings these old vines for re-planting sections of his vineyards–he calls them the mothers of all his Albariño vines. Paco Dovalo says the grapes obtained from the original Albariño vines made wine that is the model for what he tries to achieve in what he calls “my indigenous artisan wine,” Cabaleiro do Val. Dovalo, wine our ancestors. Dovalo has kept some of these old vines, which he says are unique among Albariño vineyards in Rías Baixas. Dovalo says that his wine very much reflects his personal taste, which is rooted in tradition and in his memory of wines from a by-gone era. Though he and his fellow artisan grower-producers respect that tradition and still work their own vineyards, some of which have been in the family for generations, they have evolved by incorporating modern vineyard management and winemaking equipment. But, though they have “modernized” to a certain degree, many of the winery maintain rustic touches and they continue to produce exceptionally high quality artisan wines that their ancestors would have been proud of. Paco Dovalo, grower-producer of Cabaleiro Do Val. Paco Dovalo says, "In my group of small artisan grower-producers, we make a very personalized style of wine, whose individual roots reside in the tradition and memory. Although we have incorporated some of the lessons learned from modern winemaking, we still continue the artisanal work that we learned from our fathers.” “For those who continue our style of artisan winemaking,” Dovalo says, “we hope that our new generations will maintain this tradition and endure, but for them to do that we also know that we have to build a following and an appreciation of these pure and noble limited production wines.” It was because of Paco Dovalo’s wine that I discovered this incredible group of artisan producers. One day a decade ago, I was on my way from Rías Baixas to Ribeira Sacra. I was driving through an area known more for cheeses than wine when I reached the small town of Melide. It was nearly four o’clock and I still had not had lunch, so when I saw a hotel-restaurant, I stopped. 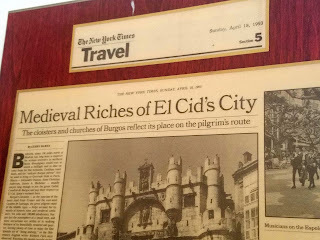 At first taciturn, as Gallegos sometimes are, the son of the chef-owner (a damned good cook trained in France) opened up as lunch service was wearing down and made some recommendations to this American stranger. 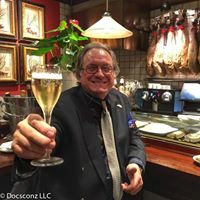 First, he offered a couple of excellent Galician cows’ milk cheeses–slices of Arzua-Ulloa and of the breast-shaped classic Tetilla–and he suggested that I might like to try a glass of Cabaleiro do Val Albariño to accompany the cheeses. The wine was stunning. He told me that it was from the jefe who had organized a group of artisan producers, who were rebelling against making Albariños like most of the larger wineries were producing. I wrote down the name of the winery and vowed to check out these producers, but it was nearly three years later when I finally tracked them down and it would be another five years before I founded The Spanish Artisan Wine Company and began to import Cabaleiro do Val and five more of these splendid artisan wines. Dovalo may see his dreams for the artisan wines of his group come true. Although the wines have hardly seen the light of day in Spain outside of Galicia, the wines of the Asociación of Bodegas Artesanas are now on the lists of such great American restaurants and wine bars as Blue Hill at Stone Barns, Blue Hill (New York City), Crabtree’s Kittle House, Picholine, Petrossian, Terroir Tribeca, Tertulia, Barcelona Wine Bars (Connecticut) and Solera. Avó Roxo joined the Asociación de Bodegas Artesanas in 2010 and is one of the group’s newest members. Avó Roxo is a traditional family winery and all their wine production comes from their own 3.5 hectares (8 acres) of Albariño vineyards are located in the heart of O Salnes, a privileged environment for the growing and harvesting of the Albariño grape. The winery began producing wines in the 1930’s under the management of Serafín Gondar. In 1975 Serafin passed the vineyards and winery to his son Antonio Gondar, who continued the wine’s development. Avó Roxo won several awards in the 70’s, including 1st place at the XXII Albariño Wine Festival in Cambados in 1974. Antonio Gondar Moldes, Avo Roxo, Asociación de Bodegas Artesanas. All Photos by Gerry Dawes©2012. The winery was named after the founder Serafín, whose nickname was Avó Roxo, Grandfather Purple (don’t ask) in Gallego. In 2007 his grandson Antonio Gondar Moldes took over ownership and management. He renovated and re-energized the bodega and winemaking. In 2007, the year he took over, Avó Roxo produced only 7,000 bottles, under 600 cases. Gondar, whose day job is doing electrical installations, says, "My dream is to live only from the winery and expand production to 12,000 bottles, doing all the vineyard work my grandfather used to do because our grapes give exceptional aromas and taste to our wines.” Practically all the wines of Asociación de Bodegas Artesanas are only sold locally to individuals and a few restaurants. Few of these marvelously original, high quality wines have ever been sold in Madrid or anywhere else in Spain, but now wines like Avó Roxo are on the lists of such American restaurants as the great New York (State) restaurants as James Beard Outstanding Chef Dan Barber’s Blue Hill at Stone Barns and at Crabtree’s Kittle House, which has one of the best wine cellars in the United States. Lagar de Broullón 2010 is made by José Pintos. Beautifully balanced, Pintos's wine is full-flavored and quite complex with lychee and green apple flavors braced by a long, clean, mineral-laced finish, but has just 12.5% alcohol, which helps make it very easy to drink. It is ideal with many different dishes, but especially with grilled fish, shellfish (for which Galicia is famous), octopus, rice dishes and cheeses. at the Festa del Encontro do Viño de Autor at Meaño (Pontevedra). Located in the heart of the Val de Salnés, in an area known as the home of Albariño grape, Lagar de Broullón bodega is surrounded by its 2.5 acre south-southwest facing vineyard that produces its signature wine. Akin to wineries in Burgundy, the bodega is a 19th Century house, where several generations of the Pintos family have made wine with intelligence and care and have developed a family tradition for authentic artisan wines on a small scale. Only about 600 cases of fine Albariño are made each year and only 100 of those will reach the U.S. market. Lagar de Broullón’s dedication to quality focuses on the vineyard and the grapes, which José Pintos believes is the most important element in wine. Although the winery has modern a vinification system, Pintos tries to make his wines with as little intervention as possible. He believes that his signature wine is steeped in tradition and through meticulous vineyard work, he tries to achieve the highest quality in his wine. We believe that Pintos has achieved his goal. 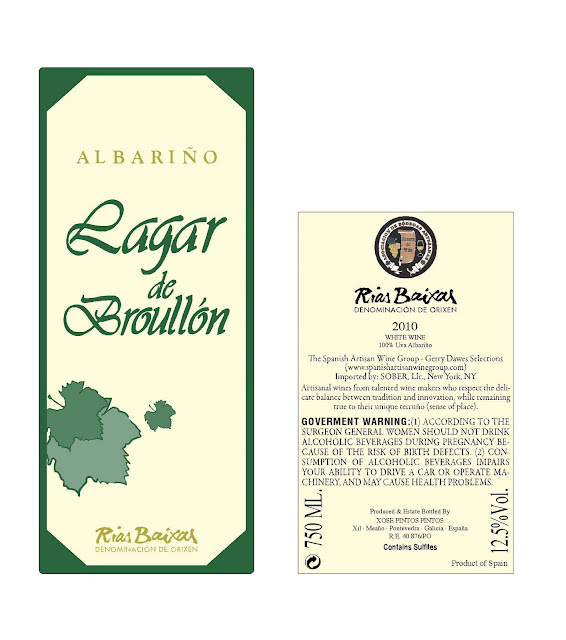 His Lagar de Broullón is one of the finest wines in our portfolio. 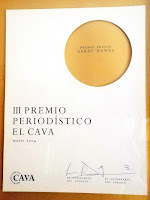 The Spanish Artisan Wine Group - Gerry Dawes Selections. Color & appearance: Deep green-gold, correct for Albariño. Nose: Pears, lime, apricots, spices, minerals. Palate: Lots of delicious fruit, including hints of pear, apricot, lime and spices, with a bracing acidity that balances the fruit. The wine finishes long, compelling sense of minerality. Bodeguero artesano Fernando Meis Otero is one of the younger members of the Asociación de Bodegas Artesanas, a group of 14 independent artisan wineries from the same area of Val do Salnés, the top subregion for Albariños from Rías Baixas. Fernando Meis farms his own vineyards of 100% Albariño grapes and ferments his must using native yeasts. Fernando Meis Otero, O'Forrollo. All Photos by Gerry Dawes©2012. At the beginning of the 1980s, Fernando Meis Álvarez, the current Fernando’s father, a vineyard owner in Dena (Meaño) decided to begin changing the mixed varieties of indigenous grapes growing in his vineyards for Albariño vines, a tough task, but with a single objective: to create the vineyard to provide grapes for his own estate-bottled Albariño. Fernando Meis Álvarez thus took his first steps into the world of making Albariño and in 1990 he registered his bodega and his wine O Forrollo with the D.O. Rías Baixas. 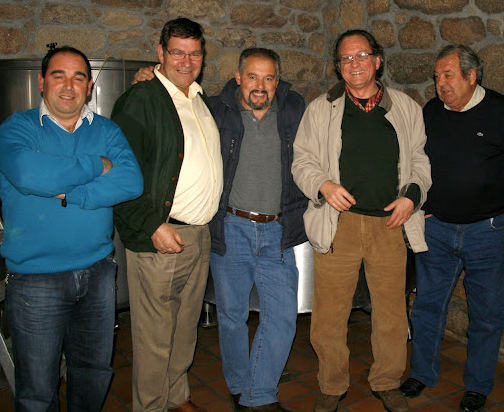 His first harvest as an officially registered Rías Baixas bodega produced just over 250 cases of O Forrollo Albariño. His son, Fernando Meis Otero, took over the direction of the winery in 2001. During the past decade, Meis has adapted new technology, in viticulture as well as in the production in the winery, but never forgetting his roots and with one objective: to produce a Rías Baixas Albariño of excellent quality. O Forrollo’s 1.5 hectares (3.7 acres) of vineyards are in the heart of the Val del Salnés (Dena –Meaño), an area which produces some of the best wines of the D.O. Rias Baixas. 85% of O Forrollo’s vines are in a single vineyard divided into four sub-parcels, the remaining 15% is in smaller plots. Albariño grapes, Meaño, Val do Salnés Rías Baixas (Galicia). The vines are trained on the typical Galician “parral” trellising system, supported on wires attached to granite posts that keep the vines and grapes horizontally suspended several feet above the ground, which allows circulation of air and helps prevent mildew and other related vine and grape diseases in this sometimes rainy climate. The soil in the vineyards is sandy, shallow and low in acidity. Albariño grapes growing on trellises, Val do Salnés, Rías Baixas (Galicia). The region enjoys an Atlantic climate, which gets abundant rainfall, but enjoys many hours of sun as well. Because of the proximity of the vineyards to the Atlantic Ocean, the mean temperature is temperature, though in summer temperatures often reach 86-90 degrees. The vines are 100% Albariño, a sweet, small berry, native Galician grape. All of O’ Forrolo’s grapes come from their own vineyards, so the harvests are limited and can vary, depending on the year, from 7000 liters (9000 bottles, 750 cases) to 10000 liters (14,000 bottles; 1166 cases). @JohnBGilman of View From the Cellar on Twitter: "2010 Rozas Albariño. 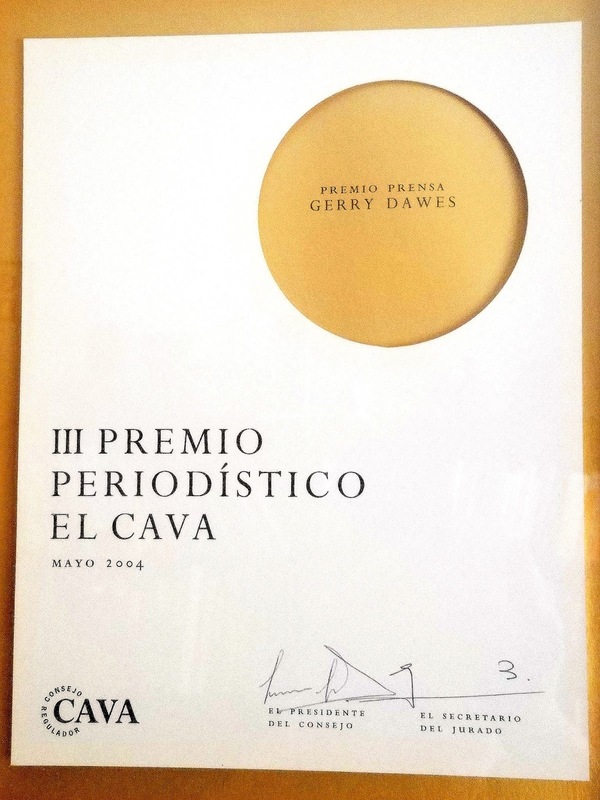 Maybe the greatest Albariño I have ever tasted - - kaleidoscopic minerality, blazing purity." Manolo Doval, Producer of Rozas, Asociación de Bodegas Artesanas. All Photos by Gerry Dawes©2012. Manolo Dovalo farms just over 6.3 acres of well-drained vineyards that get ample sunlight enabling him to produce one of the greatest Albariños of Rías Baixas. Dovalo says the secret of the quality of his wines is that the majority of the vines are very old. Some of these vines have been producing grapes for generations. The bodega was founded by Dovalo’s ancestors, who made wine for the family’s own consumption. Over the years, the winemaking gradually evolved into the modern era, where Dovalo says that his family has succeeded in integrating tradition with modern elements such as stainless steel and including the latest techniques for thermic stablization. The winery has limited production, which allows Dovalo to carefully monitor his vineyards during the growing season. The albariño grapes are picked at what Dovalo assesses as the optimum point of ripeness–never overripe–for making a great white wine. “The first time I tasted the Rozas I was stunned. This is serious Albariño - chocked full of minerals, not too fruity, dense but not in a spoofy way. Just pure with insane length. This shows similar old vine intensity to a top Do Ferreiro or Pazo de Señorans Albariño. Highly recommended!” - - Chris Barnes, Chambers Street Wines, New York City. after being injured when a grapevine he was pruning poked him in the eye. In the glass this Albariño is a light golden color. The nose offers aromatic complexity with floral notes of orange blossoms, green pears and lime, supported by racy Alsatian Reisling-like acidity and a traces of minerality in the finish. Lagar de Candes winery and vineyards are located in the village of Meaño in the heart of the Rías Baixas Val de Salnés, which has excellent growing conditions for the Albariño grape. In and around the town of Meaño some of the greatest Albariños of Galicia are made. Eulogio Gondar represents the fourth generation making wine here. Eulogio took over the winery just over a decade ago and, following the footsteps of his ancestors who believed that the best Albariños were made from the best grapes married to the soil and climate of the Val do Salnés, an area long known for its small family vineyards. The Meaño area has its own microclimate suitable for the cultivation of the vine and its own unique granitic-laced soil, resulting in grapes with excellent balance of acids and sugars, with an optimum ripeness that over the years has given albariño from this area a special identity. Eulogio Gondar, Lagar de Candes. Eulogio uses modern winemaking coupled with artisanal techniques to make excellent wines. Dedicated to making his grapes and his wines as natural as possible, Gondar had dedicated a portion of the family’s vineyards to NATURA, which designated an ecologically protected space that falls within the NATUR AGRO project dedicated to protecting the agricultural environment.